A community garden at the heart of Whitehaven town centre has been transformed following support from local businesses. A request for support was posted on Cumbria Exchange calling for labourers and equipment to restore the gardens of St Nicholas Church to its former glory. 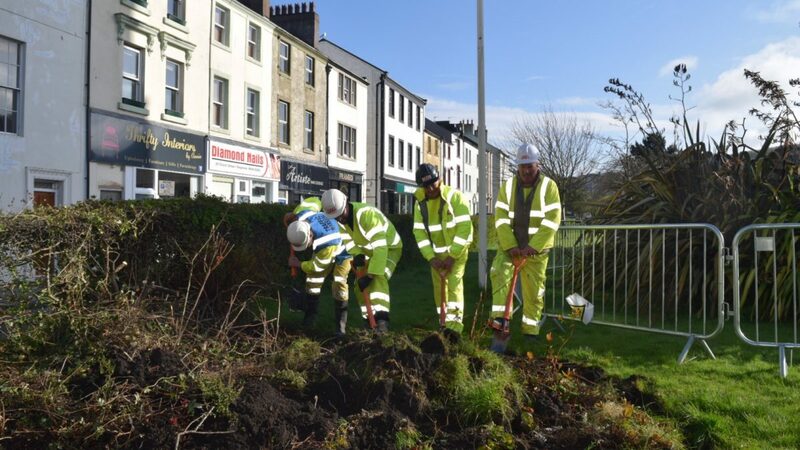 The church gardens, which are in the heart of Whitehaven Town Centre, have for years hosted an array of flower beds which were enjoyed by residents and visitors alike. The flower beds were lost a few years ago following budget cuts and thus lack of maintenance. A working group which includes Whitehaven Town Council posted the request on Cumbria Exchange. Local companies stepped in to help when the project was halted after an 1894 law came to light that prevents parish councils spending money on churches. The request was answered by the Nuclear Community Network, a group of companies working together in the community. Jenny Scott, project coordinator for the Nuclear Community Network said “We wanted to get involved because it’s such a major centrepiece in Whitehaven. It’s the focus of the town. It’s a fantastic opportunity to get involved”. Doosan Babcock, DSD Construction and A Plant collectively offered labourers and equipment. Local business West Coast Group supported the project by donating compost. Sellafield Ltd and Wood donated £2,000 to purchase the bedding plants. Tim West from West Coast Group said, “It is great to see the local community benefit from our compost which is produced from the garden waste collected in Copeland, it would be good to see more places getting use from it”. Rev Robert Jackson of St Nicholas’ said “he was delighted that organisations had rallied around and offered support”. A new partnership has since been formed with Whitehaven Town Council, Copeland Council and the Parish of Whitehaven Church Council to bring the gardens up to the standard they have displayed in the past. Brian O’Kane, previous Mayor of Whitehaven Town Council added “I would personally express my deep felt gratitude to all who helped during this period of uncertainty. The success of this initiative has proven the catalyst for the future programme between partners to guarantee the future care and development of one of the most important assets of our Town Centre”. Planting beds were restored in a community garden.